Ok over the mid-way hump now! Read an article today that focused on modern “paleo eaters” not being true to the paleo-era, which in my understanding is not the point of the modern paleo diet. The purpose of the paleo lifestyle as far as I can tell is to remove foods that cause inflammation, blood sugar spikes, insulin resistance (and others) and ensure you are eating nutritious food with enough protein and fats to feel satiated between meals. Meal 3 – Macadamia crusted fish with coleslaw from the Eat Drink Paleo cookbook, and 4x natural oysters – yum! Dinner was amazing – really. 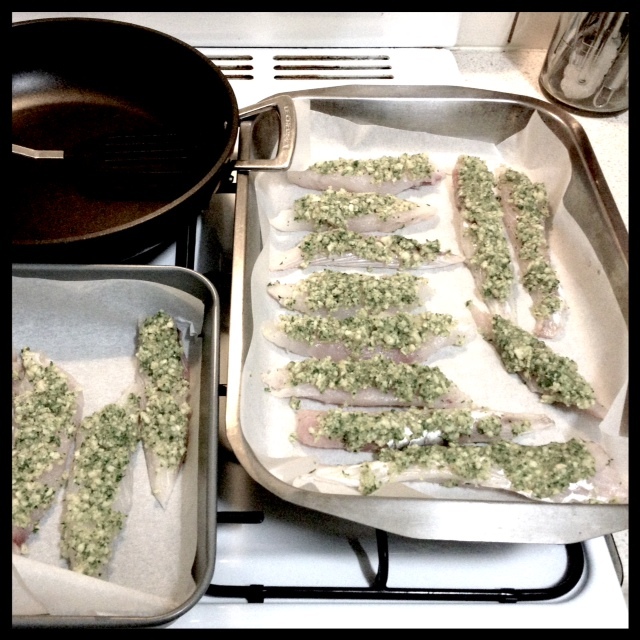 The photo here is before the fish went into the oven, but I gobbled it up before remembering to take a photo all plated up…. next time. Next Post Whole30 – Day 17: No more eggs!